Click on one of the kits below to purchase all of the components needed to make a rugged boring tool... conveniently packaged for either a 3/4" or 1" pvc pipe. other side. 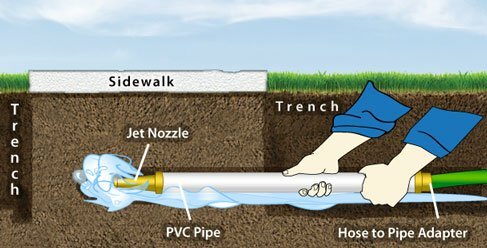 Large or small areas can be excavated by adjusting the length of pvc pipe. The tool can be reused again and again by adding a coupler to the pvc pipe. First dig your trenches on either side of the walk to the depth of the rest of your sprinkler system (usually about 6-12 inches minimum). Now using a PVC pipe cutter, cut the piece of schedule 40 PVC pipe about two to four feet longer than the width of your sidewalk or driveway. Following the directions on the can of PVC glue and glue the male adapters on opposite ends of the pvc pipe. Click here for more information on how to use pvc glue. Next, attach the brass 3/4" female hose to 3/4" female pipe swivel to one of the pvc male adapters. Then attach the brass 3/4" male hose to 3/4" pipe fitting to the other pvc male adapter on the opposite side. 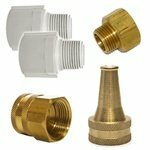 Connect your garden hose to female pipe swivel adapter. Connect the male hose/female pipe adapter to your 2 inch sweeper nozzle. Your boring tool is now assembled and ready to go. Once the pipe has made it through to the other side you can shut off the water and cut the hose end fittings from both ends of the pipe. 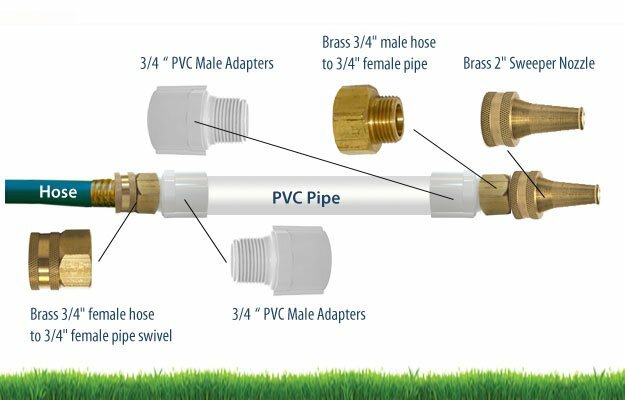 Your pvc pipe tool now becomes your irrigation pipe. Attach your fittings to the pipe and continue to assemble your irrigation pipe. Some people prefer a variation of this method and use a larger pvc pie to bore the hole once they have bored through to the other side, they push the actual pipe being used into and through the boring pipe to the other side of the path or driveway. The boring tool then acts like a sleeve. Then the larger "boring" pipe also can be used to hold irrigation or lighting wire. This method allows you to bore just one hole for multiple purposes. For example, one of the best devices to have if you have a job that requires excavation under a pathway is to use the Sidewalk Sleever. Just follow the simple steps below to see how quick and easy your job could be using this tool. Click here for more info on the Sidewalk Sleever. While straddling the trench; use a 16 pound sledge hammer to impact the Sidewalk Sleever under the sidewalk. Continue impacting the tool until the tapered end appears at the other end.